With only two more episode left, Agent Carter really heats up this week. When our episode begins, we see Russians forcing some of their countrymen to join Leviathan. Their methods are subtle, but successful. It’s a nice flashback which leads us to a conversation that Peggy and Agent Dooley have later on. 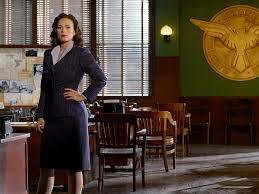 Peggy actually convinces Dooley to allow her to follow a lead that leads the trail away from Howard Stark. In the same conversation, a Russian psychologist who is probably helping the SSR points out that the Russians have been training women to be spies. This is because, considering the time period, women are not meant to be seen as threatening. This is parallel for the way Peggy has been treated in the SSR office. Peggy enlists Jarvis to track down all the women Stark has connected with over the years. She believes this is the connection to Stark’s inventions to making it on the black market. Stark even hooked up with Ginger Rodgers at one point. Jarvis makes a joke about her being a Russian spy based the look in her eye when he kicked her to the curb. The trail ends up leading up to a source which we the viewer know about already, Dottie, even though Peggy does not know its her. It’s really fun to see the whole plot unfold under the SSR’s noses. Meanwhile Sousa finally makes the connection of Peggy helping Stark. Of course he doesn’t know all the facts, but still brings it to the attention of Dooley. Peggy is forced to go in the run from the SSR, making everyone see how much of a badass she is after taking down several fellow agents. 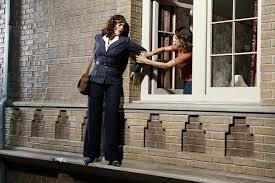 Just as she thinks she’s still one step ahead of everyone, Peggy gets a Black Widow kiss that stops her. It should be interesting to see how they tie up all the loose ends or leave us hanging if they decide to continue Peggy’s adventures. Peggy finally gets caught and has a realization at the same time. The episode leaves us wanting more and I can’t wait until the final two episodes.